We look forward to supporting you during your visit to the May 18, 2019 commencement ceremony. We do our best to make commencement a universally designed experience; most accessibility support can be managed without accommodations. If, however, you are in need of specific accommodations,* please complete our accommodation request form by May 1, 2019 to guarantee our ability to meet your needs. If you are in need of ASL interpreting, please complete your request no later than April 15, 2019. *If you miss the deadline or connect with us on the day of commencement, we will do our best to meet your needs, but will not be able to guarantee specific accommodation. Office of Accessibility Resources and Services (OARS) Staff and Hampshire community volunteers will be on site to work with visitors during the day. Please check in at the accessibility tent (located near accessible parking) if you have questions the day of commencement. or keep an eye out for our blue tye die shirts and "Accessibility Squad" buttons! There will be signage denoting accessible parking on the road as you approach the center of campus. Parking will be located behind the library adjacent to general parking. If you are looking for more specific direction to accessible parking, uniformed officers will be available to direct you. Accessible parking will be on the honor system, and you do not need to have a handicapped placard displayed to use this parking space. 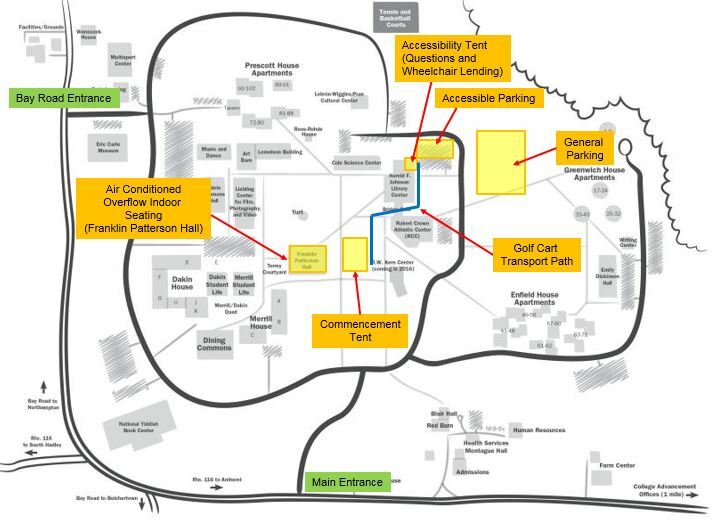 If you prefer to park in general parking and drop off those with limited mobility near the accessibility tent wheelchair or golf cart access or just to be closer walking distance to the commencement tent, you will be able to pull through accessible parking to do so. Golf carts will be available to transport visitors from accessible parking to the commencement tent. Please check in at the tent near accessible parking if a golf cart is not readily available when you arrive. For our visitors needing physical access with a wheelchair,* a section located stage right will be reserved and left initially without seats for this purpose. Because of a high number of visitors needing physical access and ASL interpreting, a maximum of 2 people will be guaranteed to accompany visitors with access needs into this section. We will accommodate more as well as we can. If our visitors are in need of a wheelchair to sign out for use during the event, there is a 10’x10’ tent that will be located proximally to the accessible parking spots. Chair availability is limited, so please reserve them ahead of time by completing the request form above. *There is also overflow seating located in the main lecture hall of Franklin Patterson Hall. There will be signs in the lobby to direct you to the elevator and the accessible entrance to the lecture hall. ASL interpreters will be interpreting from stage-right, and the seating section located stage-right will have seats available to be distributed. Real-time captioning will be integrated into the monitors throughout the tent. A live stream of the event will be available with video (but will have a lag) or a live stream of the captions alone will be available (no lag) to stream to your mobile device. Just ask at the info desk for a copy of the URL. For those visitors with limited hearing, but not in need of captioning or ASL, there are speakers placed throughout tent, and you are welcome to sit near them for amplification.